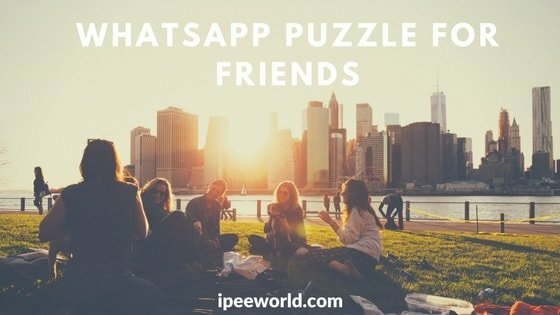 WhatsApp Puzzles and WhatsApp Dare games are some kinds of interesting WhatsApp Games that you can play to kill your free time. I know, you guys are searching for WhatsApp Dare Games for a long time, In this article, you will find a list of top WhatsApp Dare Questions along with Answers for all sort of friends. You can’t use a single Dare game for all your chats. Becuase, you may chat with your Friends, Crush, Lover, Family Members, Relatives, Colleagues, etc. So, sometime a single dare will not work for all of these chats. That’s exactly why I have included WhatsApp Dare Games from a various category for different Friends and Chats. 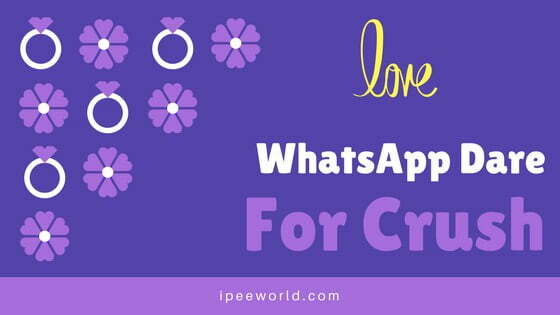 WhatsApp dare for crush, WhatsApp Dare for Friends, etc are some example of WhatsApp Puzzles from different categories. WhatsApp Dares Questions and Answers are set of Questions along with Answers that you can send to any chat of yours, even you can send it to any Group you are in. It is sometimes really good game when you have nothing to talk about. 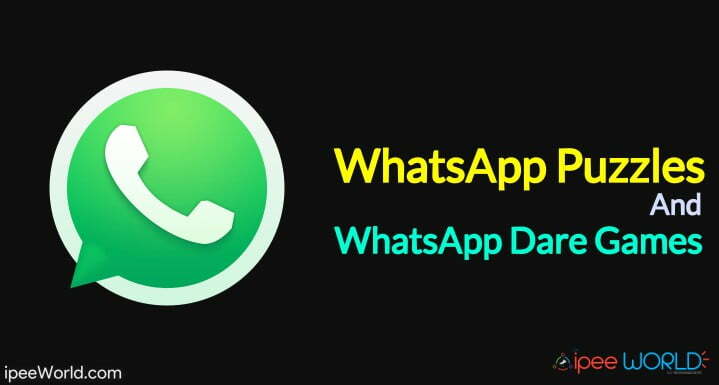 Let’s say that you are in a situation like where you wanted to chat with a person, but have nothing to start the conversation, at this time, all you wanted to do is simply copy any of the WhatsApp Dare or puzzle from below of your choice and then paste and send it to your friends, and wait for the reply. In this way, you can keep the conversation up and move, Also be sure to check the WhatsApp Fake US Number Trick. 0.1 What is WhatsApp Dare Games? 😙 – How you want me to be? 😝 – Write your status saying you love me. 😗- Put my DP and my status for 4 hours. 😒- Hug me tight when you will meet me. 😊 – Do my any work. 😉- On spot selfie must send now whatever You are doing. 😁 – Send me 10 friendship messages. 😢 – Tell me about your love . Describe him/ her. 😂 – Write a status that I am the best and keep it for one day. 😏 – I will ask you three questions which you have to answer honestly. 😥 – Propose me right now. 😅 – Write a text about me and send it to me. Select any one book from the list below. I’ll tell you about your life partner character. Choose carefully. Caring and Lovely. Difficult to find such partner. You are very lucky. Very bold and straightforward. You need to think twice before arguing. The deep thinker and romantic. Perfect life partner for you. Fashionable, social and stylish. You will be happy with your partner forever. Selfish and money minded. Be careful with your partner. They love money than you. Innocent and kind-hearted. Everyone will love and respect your partner. Let’s play a question and answer dare game. Answer to all my 10 questions and I’ll send the dare after receiving your answers. Reply fast. I’m waiting. Q1: What is your favorite color? Q2: What is your favorite chocolate? Q3: What is your nearby favorite theater? Q4: What is your favorite TV show? Q5: Which is your favorite place in our city? Q6: What is your favorite ice-cream? Q7: What are your favorite pictures of mine? Q8: Who is your previous crush? Q9: What is your favorite book? Q10: Which actor/actress you like most? Dare for Q1: Take a picture by wearing the same color dress and place it as your WhatsApp display picture. Dare for Q2: Give that chocolate whenever we met next time. Dare for Q2: Book tickets for us whatever movie is playing in that theater. Dare for Q4: Send me the last episode of that show. Dare for Q5: Take me to that place at midnight. Dare for Q6: Take me to ice cream parlor and buy your favorite ice-cream for me. Dare for Q7: Place that picture as your WhatsApp display picture for three days. Dare for Q9: You have to give the same book you like the most as a birthday gift to me. Select an alphabet from A-Z. After that, you have to change your Whatsapp status according to the selected alphabet. I successfully got my pregnancy. I’m ready to accept your proposal. I’m in love with my friend’s lover. Don’t ask my picture I’m ugly now. Recently I forgot my heart with you. Please give it back to me. I’m dying for you. Right now I’m in a secret place with my crush don’t disturb us. I wish to be a Buffalo in my next life. Oh, Gog!! My crush is in love with my best friend. Don’t ever try to cheat on me. Pick a number between 1 and 50 and I’ll dare you according to the selected number. Give a rose to your crush. Buy me an iPhone X. Gift me something when we meet next time. Selfie with your parents and send it to me. Recharge my mobile number for 1oo Rs. Send any 5 pictures of you. Uninstall your WhatsApp for 24 hours. Send any voice note to me. Buy me any gift you like. Plan a surprise for me. Give a nickname to me. Don’t message me for next 4 days. Buy a watch for me. Write about me in your WhatsApp Status. Send the screenshots or your last 3 WhatsApp conversations (Don’t include mine). Download my WhatsApp DP and use the same for your DP. Wear the smallest dress you had, take a selfie and send it to me. Call me and talk for 1 hour. Block me on WhatsApp for 2 days. Rate my DP out of 10. Take a picture of your location and send it to me. Mass dance for a sad song, record it and send it to me. Change your WhatsApp status saying you are in love with me. Call me and make annoying sounds. A selfie with me when we meet next time. Give me a hug for 2 minutes. Shout me like your dad. Make a monkey face and send a picture to me. Send any funny message to your best friend. Don’t bath for next 2 days. Send me your cute picture. Imagine your pillow as me and do whatever you want. Call me and speak something. Put a WhatsApp story with my picture and describe our character. Make a call to customer care and talk nonsense for 10 minutes. Sing your favorite song and send it as a voice note. Slap yourself and record it. Don’t sleep for an entire night. Wear same clothes for 2 days without washing. 15 Indian Cities names are hidden in the below-given clues, find out all of them and tell me the names of all cities. Select any one of your favorite multiple of ten between 10 and 100. I can say your life partner’s character. This is going to be really fun. 10: Always fighting with you. 30: Your life partner is a non-stop kisser once started kissing. 40: Every day is a honeymoon with your partner. 50: You both make a perfect couple and made for each other. 60: Always shows love and care for you. 70: Get’s angry for everything. 80: Most irritating life partner. Sorry, but it is true. 90: Your life partner always wanted to spend time with you. 100: Your life partner treats you and your child in the same way. True love. Chose any one hand moment and get ready to accept my dare. Give me a surprise treat. Request me for taking out with you. Make a call to me at midnight and say I LOVE YOU. Delete my number from your contacts. Write “I’m Mad” in your WhatsApp story for two days. Call me immediately after you wake up in the morning and say my name in a loud voice. Make my picture as your WhatsApp chat wallpaper and send our WhatsApp conversation screenshot to me. I need a favor from you and you have to do it. Do you think our present relationship will lead to our marriage? Write “weds” in between in your name and my name in your status for 2 days. Write “Please Love Me (with my name) “ in your WhatsApp story. Make a video call and show me what you’re doing now. Send me your cutest selfie. What’s your deepest secret you are hiding from me? Take a selfie with broom & send it to me. What is the one thing you always wanted to say me? Act like my slave for 3 days. Do you want a change in my attitude? What is the one thing that you like that most in my character? Send a voice clip to me saying I wanna marry you soon. Write my name in 5 different national languages in your Whatsapp status. Send me the first photo of you with your crush. 25🎸 :: Who I am for u??? 49🎸 :: What are your feelings about me? 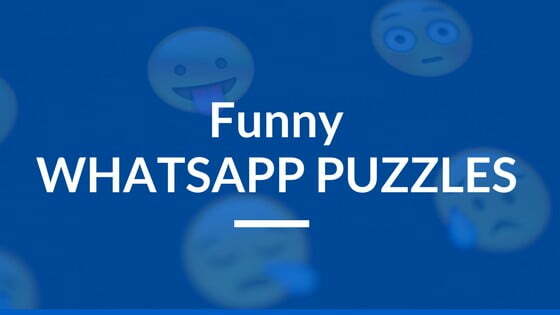 Go, guys, these are the best WhatsApp Dares and WhatsApp Puzzles to play with your Friends, Crush, Girlfriends, etc. If you are looking to kill your free time, WhatsApp Dares are something that you can go with. We have managed to share about 50+ Unique and Best Emoji, Smiley, Text, and Picture based WhatsApp dares. Now, copy anyone of your choice from the above list and send it to your friend, crush, relatives or anyone and have a good game with them. Comment down below your thoughts about this list of Best WhatsApp Dare and also be sure to share this with your friends with your Friends on different Social Media as well.